When Iyla was born the nurses at the hospital remarked about how flexible she was... a true yogi in the making! What? You are selling my new exersaucer? (Cue her to being over it immediately. It was just way too much for our home & space, & is now better serving a set of 6 month old twins. A much more modest doorway jumperoo is on its way). 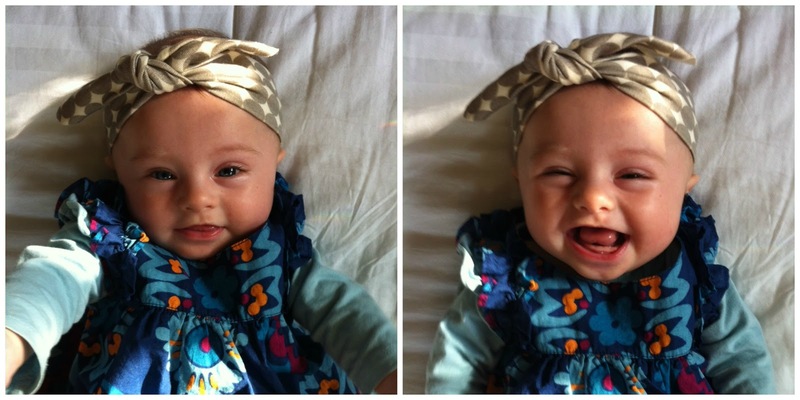 And JUST today- she started giggling a lot more!! It is the cutest thing ever! Yes, I know how to work my parents. She also was (mostly) cooperative as I got two new listings on the market- one of which went pending immediately with multiple offers. The other listing just hit today- but I expect it to go just as fast, given the insane sellers' market we are currently experiencing here in Austin. As far as Iyla's nighttime sleeping goes, her most recent MO has been waking to nurse at 1am and again around 5am, then getting up for the day around 7. As much as I'd prefer to only be getting up 1x/night, I can handle this current schedule. If it continues this way for several more weeks I may try to help eliminate the 1am nursing session- but most likely in a couple of days she'll mix it all up again anyway. If there is one thing I can count on, it's that this little lady loves variety and will continue to keep us on our toes! Guess who slept from 8pm to 6:30am this morning STRAIGHT? I have been doing this parenting thing long enough to know it's foolish to think this is a new "thing," but it IS one small step in the right direction!. She also woke up with a dry diaper & proceeded to do a #1 and #2 on her potty. Proud Mama here. And her new baby bouncer/activity center arrived! Admittedly looking at it makes me want to throw up a little bit- I have such a huge adverse reaction to big hunks of colorful baby plastic... but that is MY stuff, and I knew that having something to play in that kept her upright (her FAV position and needed for that little head to straighten out!) was necessary. We also had our first family picnic down by the water last night. Lately Iyla hasn't been wanting to sleep through our going out to eat, so this was a wonderful compromise and was enjoyed by all. Thanks to BC for planning this outing! Today I'm working on filling up on my ME time and getting more balanced. The last couple of weeks have been rough on me with Iyla's transition into her own room. It's a strange mix of the most extreme PMS with a lot of anxiety going on in my body. I feel like my hormones are restructuring themselves now what she isn't near me all night long and nursing as often. Admittedly I have been super short with BC and not the most fun to be around. I'm trying to stay mindful of what I need- and small solo outings (like working from my fav coffee shop the last 2 mornings) go a long way toward filling me up. 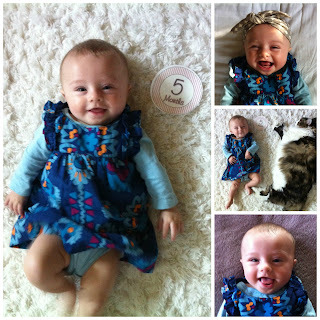 Sweet Iyla Grace, today you are 5 months old! People always comment about how smiley and happy you are. You are definitely generous with your smiles- you have so much deep joy within you. We've also heard a few fleeting giggles- so precious, and something we hope to hear a lot more of! How old? 5 months today! That inchworm is 24 inches long... you may be getting some of your Papa's height! Toes! Your new Baby Bjorn chair makes them easily accessible. *You are getting so strong & are able to sit up very well in your Bumbo chair! Talking AND toe grabbing- two of your favorite hobbies! *Moving to your own room & crib! We are now on night #4 in your own room, and the last two nights you have cooed & talked to yourself, then gone quietly to sleep without hardly any fussing. I am so grateful you find your nursery peaceful and are sleeping so well in there! We've invested in a few new teether toys due to all your drooling & hand chewing! Here, you and your Papa work on sharing. You love to hang out in our guest room. Between the ceiling fan, the mirrored closet, & our snuggles- you are definitely in your happy place! *I am actually now 2 pounds UNDER my pre-pregnancy weight! My pants are all a bit baggy. Going for daily 40 minute walks coupled with breastfeeding, no dairy, & not having a lot of time to eat is proving to be an effective weight loss strategy. *I am still losing hair like crazy. Every shower yields a couple handfuls. Hoping this slows down soon! *My right wrist has been getting frequently strained- likely because you are getting so big. What do I miss? I've been craving alone time. Simple things like a trip to the coffee shop, a pedicure, or a solo shopping spree are genuine treats these days that definitely help me feel more balanced. BC was asking me tonight if I think I should schedule a girls' nights out... sweet of him to wonder about, but what I really, truly desire is just some quiet, independent me time! Most looking forward to? I am getting SO excited for our two week road trip that begins at the end of May! Can't wait to head out and visit so many family and friends. 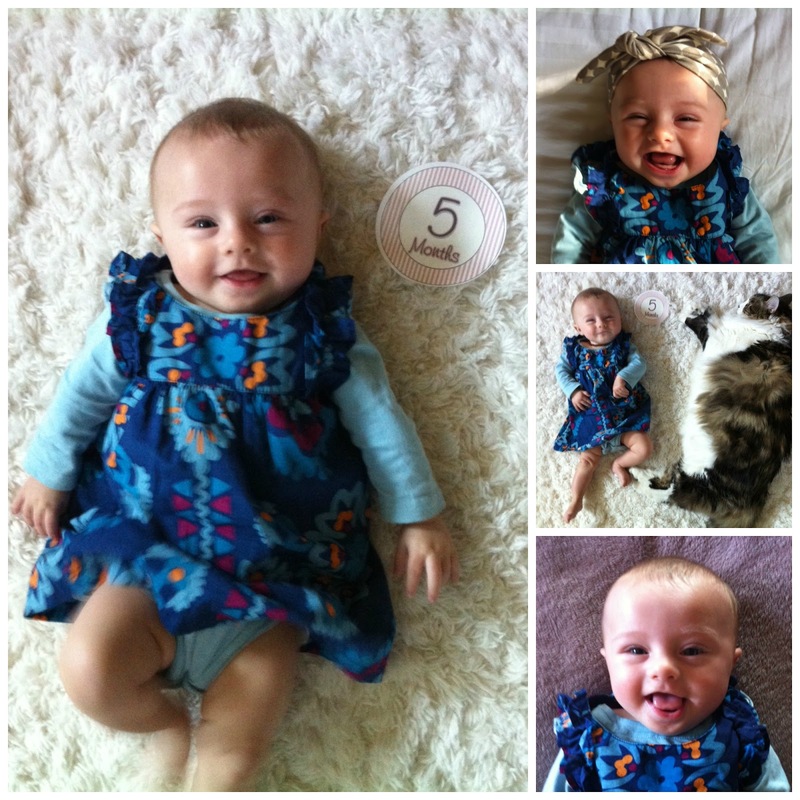 Here are a few outtakes from your 5 month photo shoot today. You are such a doll, sweet baby girl, and your Papa and I love you dearly! Heard a faint cry at 2am but she went immediately back to sleep- may have cried out IN her sleep? Up to nurse at 5am- that is the longest stretch she has EVER done! WENT TO SLEEP WITH NO CRYING. I kid you not. She talked and talked & cooed in there for awhile, and I was SURE when she realized she was tired with no paci in her mouth she'd start up... but nope, quietly & calmly went right to sleep! Now naps? Those are another story. I felt like I was seriously putting Iyla through torture today with crying it out during nap times. This led to a very overtired baby, and a very upset, stressed out Mama. Iyla and I spent the entire afternoon cuddling, where I happily let her nap in my arms for over 2 hours. My instinct is that she isn't quite ready for nap consolidation... I will continue to lay her in her crib when tired, but if she cries will get her and try other means of rest. I knew she was ready for nighttime training- and she is proving that indeed this was the case with how well she is doing- just as part of me KNOWS it isn't quite that time yet for naps. One of the brief 15-25 minute naps she took in her crib. Sadly, she spent about 3x that amount of time crying. And this was our afternoon. Both of us seriously needed the cuddles! And just for cuteness' sake, Iyla playing in her new Baby Bjorn chair. The last couple of nights with her in her own room I have been waking up constantly, both from habit and from Mama Bear worry. Every little noise I hear has me checking her monitor, making sure she is OK and still breathing. I know each night will get better... and I do know this is the right step... so here's hoping I will start feeling more relaxed & rested again soon! We are definitely on the right track. Last night was Iyla's first time sleeping in her own room and her own crib. We had decided to start sleep training and couple it with a move to her room AND the removal of her swaddle. Big changes for our little lady! In the past month or so Iyla's nighttime sleeping had regressed to getting up at LEAST 2x, if not 3-4/night. Sunday night took the cake- I nursed her at 11pm, was up with her from 2:30-3:30, up again at 4:30, then up for the day at 7. That sealed the deal to begin Sleep Camp 2013. I was dreading this all.day.long. At 7:30pm I nursed Iyla, put her in a sleep sack, sang to her, and put her down in the crib. She played & cooed for about 15 minutes, then the crying began. Admittedly I cried too as I watched on my monitor. Twenty-three long minutes later and she was OUT! I was expecting to have to endure much longer than that! At 11pm she cried for 15 minutes and put herself back to sleep, at 2:45 I got up to nurse her, at 4:30 she cried for 10 minutes, then at 7:15 I checked my monitor and to my surprise she was already up- just rolling & playing in her crib. When BC and I went in to get her she was ALL smiles! Such a big girl. I can already feel a new found sense of freedom with this transition. Last night I was able to do laundry and actually read in bed with the lights on! And this morning I followed suit with the sleep training & did a routine for her morning nap- nursed, sleep sack, sang, & laid her down- and miracle of miracles, she went RIGHT to sleep with no crying! That was almost an hour ago and she is still sleeping up there. I have gotten work done & was able to actually finish my breakfast. Up until now Iyla's naps were either in my arms or in her swing downstairs, so this is amazing stuff. We are following the "Healthy Sleep Habits, Happy Child" book. The basic premise is that little ones often need help learning how to self soothe & put themselves back to sleep- and this is an important skill to learn to ensure they are well rested. Yes- it is also known as the infamous "cry it out" method, but I tell you what- our little girl was so well rested and happy this morning, I can already tell this was the right move for her at the right time. SO proud of our sweet Iyla Grace! This is the face of a happy, well rested little lady. I will be telling Iyla about this year's Easter celebration for the rest of her life. 'Twas the year we spent 3 hours at the doctor while our 15 some guests arrived, then spent the rest of the afternoon with her scream-crying in my arms- not letting me put her down, eat, socialize, etc. Last week on Tuesday Iyla had myofascial & cranial sacral work done. It actually went really well- and at the chiropractor on Wednesday, he noted that he could tell a HUGE difference with her neck & overall muscles. So that was great news! Wednesday night I cooked dinner for BC and I- and amazingly enough, Iyla went down for a nap while I cooked. We sat down at the table like excited school kids- praising our good luck at an actual seated dinner with just the two of us. The SECOND we clinked wine glasses- I kid you not- Iyla woke up crying. Attack of the BABY RADAR! BC got her, put her in the sling, and starting pacing around the house. At one point he had to sneeze, which startled Iyla so badly she started screaming. And there was no consoling her- the screaming lasted right up until she went to sleep. Then the scream-crying continued on and off Thursday & Friday. Both nights we had plans for early dinners out with friends, and both nights Iyla had absolute MELTDOWNS of intense, inconsolable crying. Very out of her recent norm. A quick desperate poll to my November Mamas Board Friday night led to several responses saying it could be an ear infection and that I should take her in to be seen ASAP. Saturday I got an appointment with the on call doc at 11:50- 2 hours before all of our company was scheduled to arrive. Iyla and I waited for over an hour to be seen. When we finally got into the exam room, I seriously felt like I was putting my sweet baby girl through torture. They took her temp rectally (a first for her) and proceeded to check her ears & mouth. The on call doc did NOT have a gentle bedside manner, and poor Iyla was crying during the entire exam. The good news? Ears were clear. The bad news? We still didn't have answers. The doc said we needed to do blood work & get a urine sample. My poor girl had to get her toe pricked for blood and then have a catheter inserted to extract urine (we'd waited 45 minutes hoping she'd pee on her own, but to no avail). Seriously?! Good God. I put my daughter through all that to be told she was TEETHING?!? We did discover something at the visit that totally made it worthwhile to be there, however. When the nurse was examining Iyla, she discovered that Iyla's private little lady parts had partially fused together. It was a total surprise to me- I didn't even know that could happen! The nurse had to slowly pull them apart while Iyla screamed some more. I am to now check on those after every bath to ensure this doesn't happen again. I am SO glad we caught it now, before things closed up further & we did have issues with infections/etc. When we finally got home to a house full of relatives, Iyla and I were both totally spent. She proceeded to spend the entire afternoon scream-crying or sleeping in my arms- not wanting to be put down. There were a few brief beautiful smiling moments- but those were fleeting, and our guests didn't really get to enjoy her. Not that I blame her after all she had gone through! I look exhausted, and I was. Not only did we have a rough afternoon, but Iyla had been up 4x the night before. Iyla's fussiness continued Sunday... but I am happy to report (knocking on wood here!) that today the clouds seemed to lift and my sweet, playful, smiley little girl made a return. It's amazing what a good mood that instantly puts me in! I leave you with several photos from this past week. Here's hoping my little lady continues to have happier days! I call it a draw!